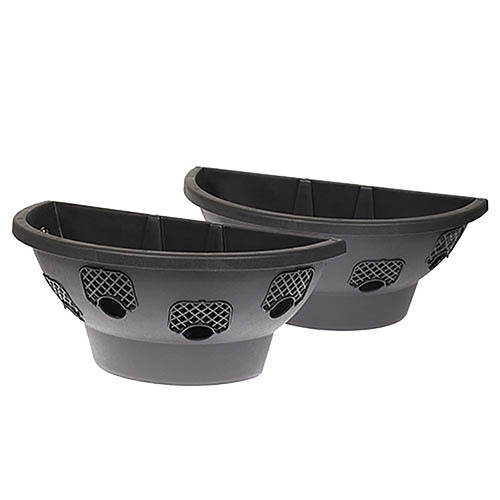 Just like the Easy Fill Hanging Baskets the last wall planters you will ever need to buy! EasyFill Wall Planters, just like the EasyFill Hanging Baskets, will be the last wall planters you will ever need to buy, the best ones you will ever grow AND they will allow you to grow the most impressive displays in your street! Requested by professional growers, who used and loved the hanging basket version, they are now available for you to use at home. The unique patented design allows you to plant from the outside in, passing each grown on plant through the pre-formed apertures without any root damage whatsoever. Once in place, slip a lattice gate in to position and it will hold the plant in perfect position with the roots inside and the leaves and flowers outside in both cases perfectly unharmed by the process! Any guess work as to how many plants you need is also removed, as you simply plant one per aperture! Also, the design means that the whole wall basket is planted top, sides and bottom, so the visual impact is immediate, stunning and long lasting. The lattice gates ensure the roots of your plants can breath, and the copious size of them means that each plant has enough space to reach its full potential. There is a reservoir that holds excess water and plant food for when your plants need it and you can fit up to 12 plants per wall planter. Each basket accomodates 11L compost. Now you can really make the most of any vertical area and create your own waterfall of fabulous colour all year long. Manufactured in the UK out of UV resistant co-polymer so they will last for many years and supplied with a very strong bracket and all necessary fixings. Plant them up with grown on flowering plants for an immediate display! Supplied as a pair of 50cm (20') long EasyFill Wall Planters, each complete with 5 lattice gates, a very strong wall bracket, and all necessary fixings. Ready to install. Room for up to 12 plants. Basket manufactured in the UK from recycled and UV resistant co-polymer. Note We recommend the use of Gel & Feed Plant Food when planting up your EasyFill Wall Planters.